I have read The Little Prince. I have read Night Flight. But this book by Antoine de Saint-Exupery unites them under the larger umbrella of flight. Of what it was, exactly, to be a pilot in the 1930s. I can scarcely imagine how a pilot can also be so skilled a writer. After two evenings, I am only on page 38 because I must stop and contemplate all the things he has to say. It is quite interesting to read this book on the heels of The Sorrow of Angels. Imagine two mail carriers, one from Iceland and the other from France, who face the elements with indomitable courage. I couldn’t have planned a better pairing of novels if I’d tried. More on this one, Wind, Sand and Stars, when I finish. Thanks to Therapy Through Tolstoy for the inspiration to pick it up. Sounds a book you have tro go through slowly. I have to read Winds, Sands, and Stars twice to have an understanding of what he was writing about. I have to read it again. Thank you for the tidbits. Wow. What quotes. Great share. I loved reading these. Yes! I'm so glad you seem to be enjoying it so far 🙂 Thanks for the mention! Of course, it can be read quickly. But, I feel I would miss so much! Plus, the writing is quite beautiful. I wish I could still read French as when I read Le Petit Prince. books to read in tandem. I can see why it's a classic, why Saint-Exupery's face graced the twenty franc bill before the conversion to euros, and why he's such a beloved author. I don't think I like this more than The Little Prince, but certainly as much. And these are only from the first fifty pages! I can't imagine how many more are to come. No, Lucy, thank you for reminding us of this tremendous book. Really, I can't recommend this enough, Arti. 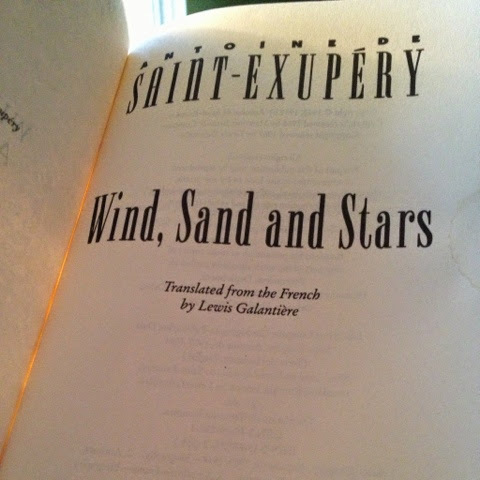 Wind, Sand and Stars was my first taste of Antoine de Saint-Exupery and I loved it so much (glad I read it first because I was definitely not a fan of The Little Prince). I have a biography of him, somewhere. Glad you're enjoying one of my old favorites!